Lamprocapnos spectabilis growing herbaceous of the genus Lamprocapnos also known as Bleeding heart plant, Lamprocapnos spectabilis perennial evergreen or deciduous plant used as ornamental plant or as cut flower, grow in temperate, cold subtropical climate or as houseplant and growing in hardiness zone 3-9. 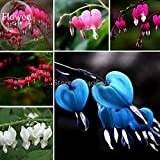 Flower in heart shape with tongue of a bell, heart shape color can be: purple, white, pink or red, tongue of a bell color can be: white, pink or red. Black and blue flowers probably not exist and it’s picture editing. 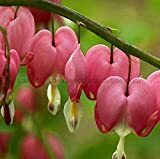 Lamprocapnos spectabilis known as Asian bleeding heart is a species of flowering plant . 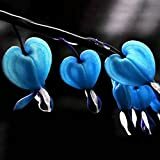 Heart shape with tongue of a bell, heart shape color can be: purple, white, pink or red, tongue of a bell color can be: white, pink or red.